When I decided to make two new recipes for dinner out of a brand new Malouf & Malouf cookbook, I figured there was a chance it might be a complete flop, but at least it would look pretty. 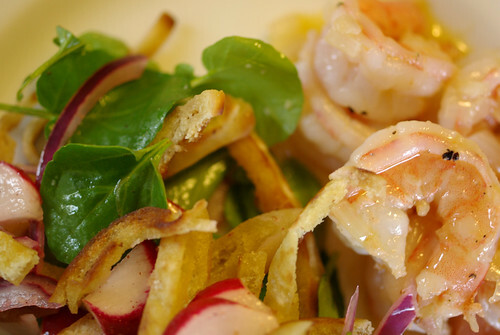 Fortunately for me, it was pretty and tasty: shrimp with ouzo and garlic, and a salad of watercress, red onion, radish and fried strips of pita bread. It was good enough to make again; a little tweaking is in order for next time, of course. 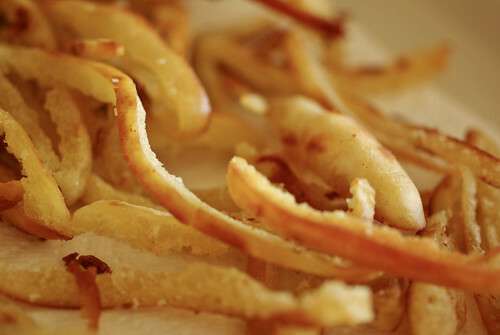 The most exciting part was cutting a pita bread into thin strips and frying it in olive oil and butter until golden and crispy. That was really, really fun. The resulting croutons were almost like buttery potato chips. Rubbing sumac and lemon juice into sliced onions was rather fun, too, although I might leave the onions out next time (or just use a lot less). They were rather overpowering – Greg Malouf always seems to start his recipes with “one small red onion” and it’s always too much for me (you’d think I’d learn). 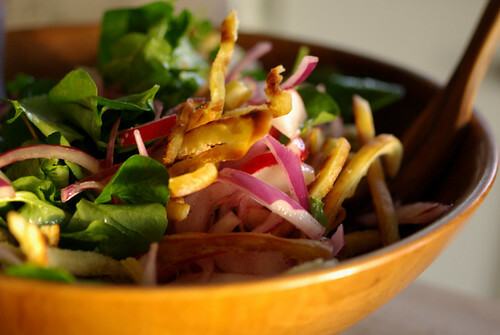 The watercress and sliced radishes were simply tossed in with the seasoned onions, and that was it for the salad. Easy. The shrimp part was also simple: I peeled a bowlful of large shrimp and sauteed them quickly with garlic and olive oil. Before they had finished cooking, I poured in a little white wine and a small glass of ouzo and let the shrimp simmer in the liquid until almost dry (the original recipe calls for arak, which our local State liquor store did not have, shockingly enough). The shrimp and the salad mounded on plates together was really pretty, and the flavors were lovely. 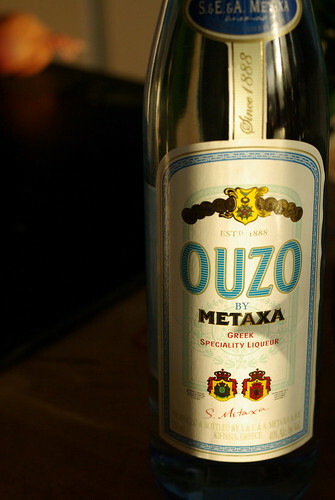 It would have been great with some chilled ouzo, but we had a nice floral white wine that went splendidly as well. So far so good for this cookbook!